There are mathematical models that the Universe is infinite in shape and size. Although infinite, the technology of mankind certainly does have a limit. 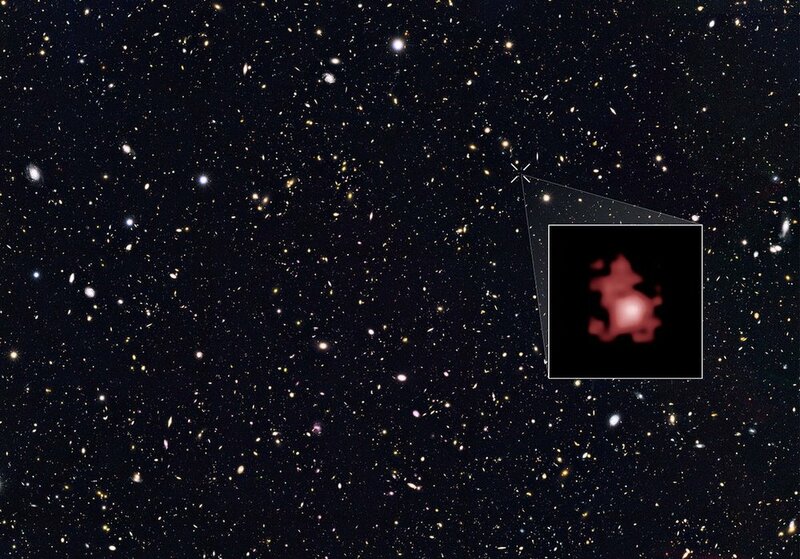 The most distant object observed is a small galaxy, gn-z11. Not a very interesting name but it definitely is one of the most fascinating objects in the cosmos. Due to extreme distance the most cutting edge telescopes are required to observe it. The galaxy itself is located in the constellation Ursa Major was found by teams studying images and data from the Hubble Space Telescope's Cosmic Assembly Near-infrared Deep Extragalactic Legacy Survey (CANDELS) and Spitzer Space Telescope's Great Observatories Origins Deep Survey-North (GOODS-North). The research team used Hubble's Wide Field Camera 3 to measure how for away GN-z11 was, by splitting light into its component colors to measure the redshift caused by universe expansion. This galaxy is at a proper distance of 33 billion light years from us. The universe is 13.8 billion years old, the expansion of the universe takes this galaxy to 33 billion light years at proper distance. As it is impossibly far how is the distance measured? Cosmic redshift. As the light emitted from this galaxy travels through the cosmos, the light loses energy and the wavelength widens. The wider the wavelength, the redder the object. The galaxy itself is quite small. It is around 1/25 the size of our own Milky Way galaxy with 1% of the mass. Given the star formation and size of this galaxy, we can tell that it is around 13.4 billion years old. A very early galaxy. In astronomy, the further away we look the further back in time we see. The light being emitted from this galaxy has taken 13.4 billion years to reach us. This galaxy gives us a view of what the universe was like 400 million years after the Big Bang. Although the galaxy is quite small in comparison to ours, it is still quite large for such an early galaxy. It is forming its stars 20 times faster too. So at the proper distance of 33 million light years, this galaxy is moving away from us faster than the speed of light. We can see it now because when it emitted it's light it was much closer to us. The light emitted from this galaxy today will never reach us. By the time light from their galaxy gets here, the sun and Earth would be long gone. Interestingly, to any observers on any planets inside that galaxy, we would be moving away from them faster than the speed of light aswell. There is at least one planet per star in our sky and current models feel that most galaxies are not much different. As this galaxy is so far away, and the Earth will not last another 13.4 billion years to see what this galaxy is like as of today. Within this galaxy intelligent civilisations like ours may have lived and become extinct inside this time.